“Undefined”…I have to admit when they launched this new line at convention this summer I just didn’t get it. I thought the completed stamps looked a little kindergarten-y and the whole idea didn’t speak to me creatively. But….I decided to order the kit and give it a whirl. I really wanted my very own “glamper” stamp so that is what I made! I have to admit, it was really fun! and I love, love the way my stamp came out! I gave it the Shasta wing and made it look as vintage-y trailer as I could! Now that I had the glamper, what better colors to use than Tempting Turquoise and Real Red? Perfect! 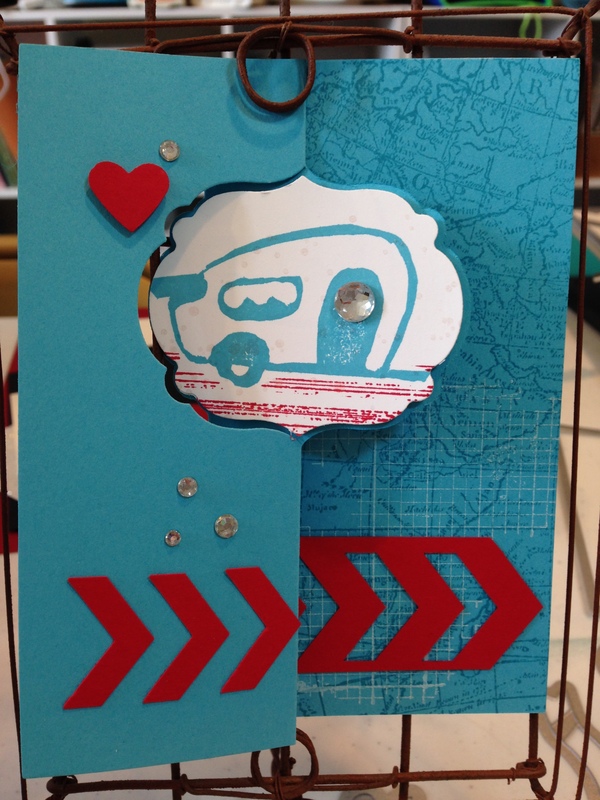 I used the World Map background stamp and stamped it in full strength Tempting Turquoise on a piece of cardstock cut to fit exactly on the right side of the swing card. On top of the World Map image, I stamped “Off the Grid” in Whisper White. Another little trick I did was to use the Chevron Punch on a 1 1/4″ strip of Real Red card stock. I trimmed the front end to match the “V” and I trimmed the back end to fit into the fold of the card. Then I lined up the punched out chevrons to match the strip on the top of the fold. The last little old school technique I used was to mask the trailer and then stamp the “tire tread” image from Gorgeous Grunge under my little trailer. After I added my tire tread, I stamped one of the Gorgeous Grunge splatters on top of the glamper image with Illuminate Ink. I think I put Illuminate splatter on almost every card I make these days! The whole card is full of symbolism to just hit the road and “get out there”! I can’t wait to have my own little glamper to do just that in! My bestie SIL just got a cute little glamper last weekend and her stove is turquoise. 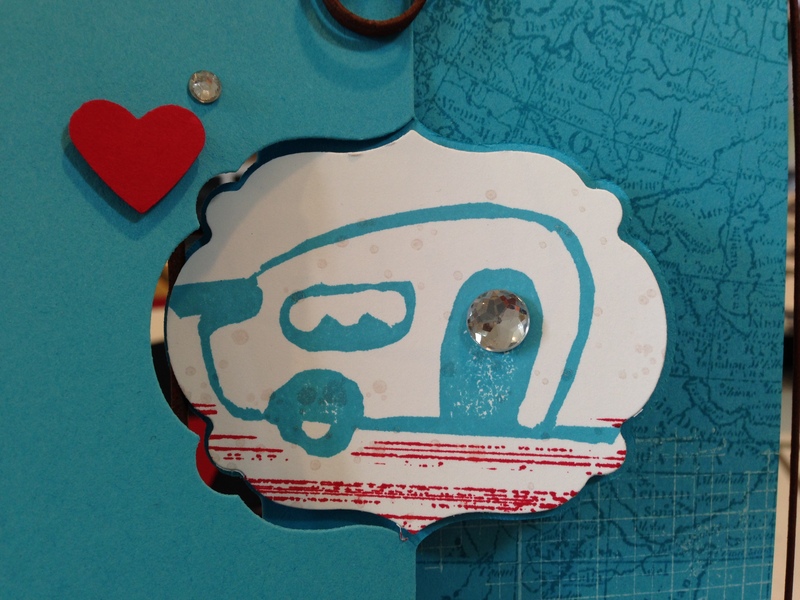 I think I will send this glamper card to her to celebrate her new little home on wheels! I’m so glad you are back to enjoy our creative inspiration! I continue to be awed by the skill and creativity of my fellow friends on this hop! Be sure to come back every other Monday to see what we have up our sleeves for you! This entry was posted in 2013 Artisan Design Team Finalist, 3-D, Big Shot, Cards, Stampin' Up, Techniques, Vintage by kate80132. Bookmark the permalink. Great stamp carving!!! I am not skilled in that area-at least not yet. Maybe if I try again. My attempt at convention was pretty bad. I love your colors and all of the fun details! I love the glamper stamp you carved! Too much fun! It’s too cute!!! Great card!